LISTEN TO THE CCB FLUTE ENSEMBLE! The CCB Flute Ensemble is one of the newest sub-organizations of the Chatham Community Band to be making a musical splash in the community. Led by Myra Cole, the ensemble entertains at nursing homes, farmers’ markets, and other special events throughout the year and even serenades audiences as the “opening act” at Chatham Community Band performances. “We have a lot of fun and really enjoy making music together. We play all types of music from classical, holiday, jazz, big band, movie, folk and Broadway music to patriotic medleys,” says ensemble member, Melissa Merkel. Playing at the highest register of all of the instruments in the band, it usually isn’t hard to hear the flute section during a Chatham Community Band performance. In an Ensemble setting, both the players and the audience share a unique opportunity to hear the diversity and complexity of the instrument. In fact, one ensemble member even plays the alto flute, a beautiful, soulful instrument not often heard or seen in a traditional band. Over the past year, the Flute Ensemble has performed at Lester Senior Housing, Care One, Sunrise Assisted Living Facility, the Chatham Farmer’s Market, and the Chatham 9/11 Memorial Dedication Ceremony, to name just a few of the events. 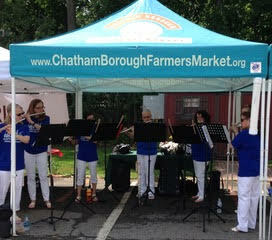 The CCB Flute Ensemble is actively seeking new opportunities to play in the community. They are available year round and can design a musical repertoire that will be perfect for your next event. To find out more about the group and inquire about future performances, please contact Myra Cole at musicmamamd@gmail.com or call 917-922-7958.